Breathe easier with WELD-ON® ECO™ Series – high strength, ultra low VOC series of solvent cements and primers meeting tomorrow’s regulations today. 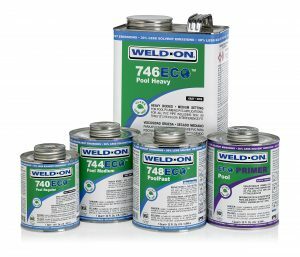 Gardena, California – March 4, 2019 – Weld-On is proud to introduce the new Weld-On ECO Series of ultra low VOC solvent cements and primers. The ECO Series’ unique, proprietary formula achieves the same bond strength in plastic pipe joints as Weld-On’s current cements but with 30% lower solvent emissions and odor. With this new environmentally-friendly formula, the ECO Series has ultra low VOC content that is far below the current SCAQMD Rule 1168 VOC limit and will also meet SCAQMD’s proposed VOC limit set to be effective in 2023. The lower rate of solvent emissions and reduced odorous fumes from the ECO Series contributes not only to a better environment but also to improved working conditions for installers. “Weld-On is committed to being innovative and finding the best pipe joining solutions. We care about making quality products and care more about our valued customers. The new, ultra low VOC ECO Series is revolutionary in the industry for the way it achieves maximum performance and joint strength, while doing so in an environmentally responsible manner. I am proud to say that Weld-On, with our ECO Series, is the first in the industry to meet tomorrow’s regulations today.” said Janet Reilly, President of Weld-On. This new line of ECO cements is available as regular, medium and heavy bodied PVC solvent cements and complementing primers for irrigation and industrial application, as well as pool and spa use. ECO Series products are certified by NSF International to NSF/ANSI Standard 14 and 61 and the Uniform Plumbing Code for use on potable water applications.